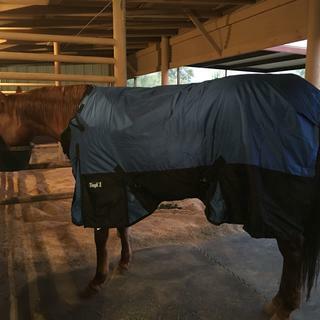 Protect your horse with the Tough1 Extreme Turnout Blanket. It's made of a 1680 Denier waterproof ripstop poly outer shell with a 210 Denier lining and 250 grams of polyfill. The material is breathable to keep your horse comfortable. The adjustable Snuggit neck allows you to customize the fit to your horse. Shoulder gussets and rear surcingle gussets allow freedom of movement. It is recommended that Tough1® blankets be hand washed in cool water using mild detergent. This may extend the life of the waterproof properties of the blanket. If washing in a machine, it is recommended that a commercial grade machine with cold water and mild detergent be used. Remove as much loose hair and dirt as possible before washing. This will make it easier for the machine to effectively clean the blanket. Straps should be adjusted to their shortest length or removed, if possible, when machine washing. If a spot remover is to be used, test on an inconspicuous area. Blanket should be hung and allowed to air dry. Great blanket! I have one for each horse, also the sheets. My horses are turned out together and roughhouse....they have lasted! Tough 1 products are truly tough! Love the turnout blanket. would recommend it for sure. Very sturdy.. Fits perfectly according to size chart. warm even on our snow days. I love everything about this blanket. Many options to adjust the fit. Shipped very quickly. The horse that wears this blanket is the lowest man on the totem pole and it shows no rips. It's been exceptionally cold and snowy this winter and he really loves it. I have had other brands and prefer this one and this brand holds up well. Very affordable. I will buy another to replace my old ones. I love this blanket on my Friesian. I can snug up the neck so it fits without a gap. It keeps her toasty warm on these cold nights! Seems well made, love all the adjustments and the high neck fit. nice looking and good fit. Perfect. Just what we wanted! (Me & Sally my horse). I moved from TN to CO so my horse is wearing his blanket more. My TB has a long, sloping shoulder and his old blanket started to rub. I liked the length and the idea of the adjustable neck but it is almost too small. I got the 75” for my 72” horse but I wish I had gotten a 78”. The blanket will easily adjust down 8”. I used a screw on the front strap to give him breathing room. Washed twice last year and beginning another year with this blanket. Have 2 other horses in these for the second year. They look good and are holding up well. Just purchased 2 more. They are very similar to another brand but half the price. Great value! Love these blankets!!! I just wish the belly straps would stay up better. But all n all a great blanket! My 10 yr old QH has had this blanket for a few years now. The blanket is waterproof & has held up to his rambunctious play through the years! Best turnout blanket I have found. We have used the Tough-1 blanket for years now and they are indeed a tough blanket. This is the first time I have had to replace one in years. Great blanket for a good price. Use them on all our horses. Comfortable in the frigid temps. Bought this product for my two AQHA mares, product's fit and finish is very good. Very easy to put on and remove. Horses love the product and they perform well. I would buy again. This is my third blanket and I have finally found a brand that fits well and is durable. The high neck with adjustable straps mean that the front closure stays closed and tight. The front clasps are great for easy off and on. Now 6/7 horses in our barn wear Tough1 coats and we love them. Good quality blanket - only negative so far is that it is smaller for its size than other blankets I have used. I also bought the lighter weight of this sheet. I like the deep gussets,front closure and the well made construction. Provides comfort inmovement. I just replaced two 1200d 300 grams fiber turnouts I used 4 years with Tough-1 1680d 250 grams fiber snuggit extremes. I use the 1680d weave because 180 to 250 grams fiber insulation keeps body warm even with nights below 0 F. temperature in Colorado. If my horses are wet I first use the non-toothed side of a shedding blade to remove most water from hair - the damp hair will dry through these blankets in a few hours. The 1680d is a lot less prone to tearing from grazing in brush thickets (horses that bite will tear any blanket). Got my first rain/snow last night and I was happy knowing my horses out on the range would stay dry under their blankets. Beaded water on the new blankets reminded me that I need to reapply kiwi fabric spray waterproofing on topside of my older blankets. My horse will shred a blanket in seconds. This blanket doesn't have a tear yet! It doesn't fit the best on my horse's neck but it is nothing too terrible. Overall, I love this blanket! On this order I purchased four Tough-1 Turnouts, 3 of them 1200 D and this one the 1680 D , the 1200 D are holding up beautifully but the 1680 tears, it was torn the first day and on each subsequent days so now is requiring major repairs. Horses all in one group and the 1680D is being worn by one of the largest and quietest horses who does not get picked on. Disappointed that it would get snagged more then the others who are of supposedly less strong fabric. So far..The blanket is holding up well and fits just as described! These blankets fit well on my two hard-to-fit Arabians. It has adjustable straps on the belly, legs, chest, and even the neck, which makes it fit on an Arab better than most. It even is still alive after my trouble-maker tried to climb a fence with it, and didn't rip. I would definitely recommend the 1680D for anyone with a horse who is rough on....everything. This turnout is excellent for the weather conditions here in Minnesota! Absolutely love this turnout. It is true to size - and with adjustable shoulder, this fits my horse perfectly. The turnout has solid stitching and high quality construction. I also love the blue color! I've already had many compliments on the turnout. This is the softest blanket I've ever purchased! Not at all stiff like most you buy. Durable, flexible, and comfort all in one at a great price! Bought one for my Arabian. Perfect fit, sturdy and warm. No rubbing anywhere! Plus, very fancy blanket! So happy with it. These blankets are great quality and seem to be very durable. The insulation seems to keep them very warm in temperatures from 0-30 f. With low activity level you could prob leave them on up to near 40 f. The straps could use a bit more adjustment room for a snugger fit but hasn't created any issues yet. Also has excellent water repellent qualities. Will definitely keep your horses warm and dry. My mare is comfortable in this blanket. A 78 is a 78. My mare is turned out with three other horses and so far no snags or tares. It is holding up really well. 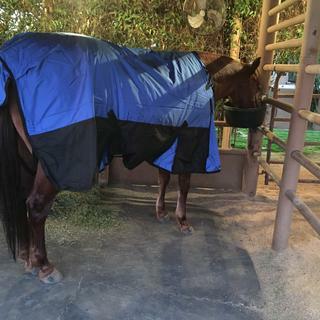 If your horse lives outside, you have to try this blanket. 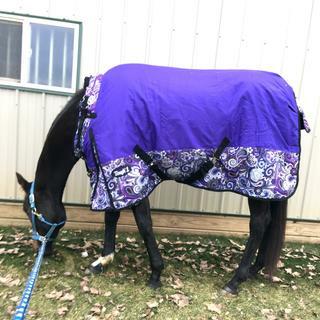 I purchased this blanket and so far so good but my horse has only been wearing it for a couple of weeks. The only problem is that it is starting to rub on either side of his chest. I am wondering if it is just a bit too small for him but he usually wears a 75 perfectly. 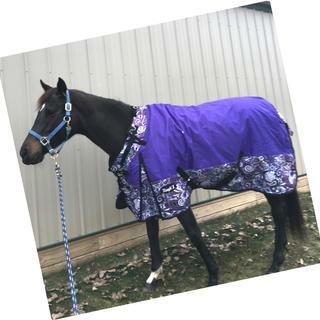 He is a 15.3 hand paint (quarter horse / thoroughbred cross) Then again I have never bought a tough 1 blanket either, as every brand has a different fit. Aside from that, this blanket looks to be very well made. It is very thick and will stand up to our Illinois winters. I also like that there are 3 sets of gussets instead of two like most other blankets. This creates more freedom of movement for him. Neck is also adjustable which I have totally taken advantage of this feature to make it fit him. Cant say much about the durability in terms of pasture play because I have only had it a couple weeks. For the price, this blanket is a steal. Other blankets that are similar are much more money. This is the third Tough 1 rug that I have purchased. I am pleased with the overall appearance, however there is a seam thread coming loose. The rug was purchased less than one month ago. 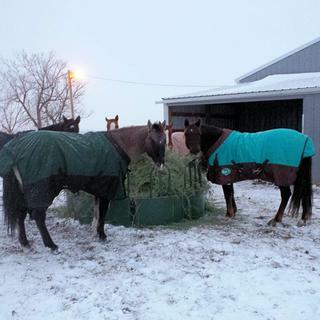 FIrst i would like to recommend Horse.com for there fast service i ordered my blankets on 3 Dec. 13 and received them on the 5 Dec. 13 just in time for the big storm that hit Missouri and boy were my horses happy they came. The blankets with the ajustable neck made them fit perfectly, my big Mare is bulk and hard to fix because of her size but these blankets fit like a glove on both of my mares. I am extreamly happy with them, they are not normaly hard on equipment but i do have a lot of brush and trees in my pasture they rub on so am waiting to see how these stand up and will write another review at a later date. Thanks again so much for your fast service. My ladies really love the warmth. 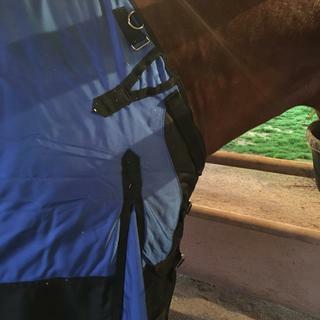 I have one on my mare and it is very good stays in place, warm but not too hot. I need 2 more for my older Geldings now with the cold coming next week. want to try the 1680d for durability. hope the quality of this blanket will be good , the price has also made it attractive. I have one of these for my other horse, I love that it goes up high on his neck, so decided to get one for my Arabian. Stands up well in our cold winters, below zero weather. On sale - need a second blanket for winter weather. Good quality and excellent price. I do not know this brand, but the description of its features, such as the fabric strength, seemed superior to others for the price. It was worth investigating through this purchase. I had one of these blankets before and it lasted 2 years. Great blanket. Is this considered a medium weight blanket? It depends where your from. But the blanket itself is heavy duty material which keeps it from ripping, and the insulation in this blanket is a little higher than normal. So insulation wise it is a little heavier than normal, and blanket wise, it is heavy duty. Don't make the mistake I did, and order a Sheet (no insulation) when you want a blanket (with insulation)...I ended up with both. Good Blanket and sheet though. I consider this a medium weight for our cold and long MN winters. My horses are inside a heated barn at night and I remove the blankets. I would only need a heavy weight if they stayed out 24/7. Great value, good insulation without being very heavy. This is my second year and they look great after 2 washings. I just purchased 2 more. It seems to be medium weight but is somewhat heavier due to the outer fabric being 1680. I haven't used it yet so am not totally sure about it. It seems well made and heavy duty for the money..alot of bang for your buck! This is just a little bit heavier than a medium. It works well up to about 45 degrees and then gets a little warm for our horse. It is extreamly well built and will work down into the minuses. I am very happy with it. It does not have the thickest fill and breathes very well which is why I would consider it a medium fill. I recommend this weight to my clients because you can always layer in extreme below zero weather. Yes, this would be considered a medium weight blanket. The material and stitching are excellent quality. The sizing was quite accurate - and it fits my horse perfectly. This is a GREAT turnout ! It is a heavy weight blanket. The extra length helps block the wind. If it is under 300 grams yes it is. BEST ANSWER: Yes-2 rear leg straps. I took off one strap (both ends have a snap) and saved it in case first one breaks. I hook the one strap under the tail to each of the rear hooks. It seems to work better than leg straps with less irritation to the horse. Nice thing is you can use it either way. Hope this helps. Our horse is enjoying her new blanket with the current cold snap! No, tail strap. Not sure if I would want a tail strap. I have purchased 5 or 6 of these in the past couple of years and I am very pleased with the product. Would recommend and buy again. This item does not have a tail strap but it does feature adjustable elastic leg straps. There is a tail flap and two back leg straps but not a tail strap. Is this water proof? I live in a spot with a LOT of rain, we do have a shelter but my mare doesnâ€™t like to use it often. I need something that Water proof and stays dry for a decent amount of time. Thanks! BEST ANSWER: Yes, it is waterproof. My horse is hard on blankets, so I bought three of these and alternate them on him throughout the winter. He stays warm and dry. Yes the blanket is waterproof. My 10 yr old QH has had the same blanket for a few yrs now. The blanket has held up well to his rambunctious antics!! Have used mine in Michigan with lots of snow and rain and very cold. Washed it a couple of times. Works great, waterproof and tough. I love my Tought 1 Snuggit.. Yes, it does keep them dry and is water proof. Very good quality blankets to keep them warm and dry. I never ordered a 84 in Snuggit 1680 Turnout, but I ordered and have a 75 on a TWH gelding. It is waterproof at this time. Yes it is waterproof! We've had torrential rain lately! Is this blanket true to size or does it run big? BEST ANSWER: Runs true to size for all three of my horses who each have two of these. Iâ€™ve always bought 82â€™s for my boys. But this time I bought the 81 as it did not come in 82. Fit just as good. I have found my Kensington blankets run true to size. I love the fit for both my horses. What determines the warmth of the blanket as well as lowest temperature rating? BEST ANSWER: While I'm not a manufacturer or expert, I believe it is the Denier or density of the outer weave and the type of insulating material and it's thickness that gives the rating. I live in northern NJ, have this blanket on my 29 year old Quarter horse now and he is snug as a bug in it. I like the belly strap style as it keep the belly warm, but also does not have the hanging straps to worry about getting a leg caught in. Not sure on lowest temperature ratings tho. This blanket is 250 grams its a med weight so compatible for 25 degrees or colder. The amount of â€œfillâ€ - the thicker/ heavier the fill, the warmer the blanket. Does it stand up well being out with a group of other horses? BEST ANSWER: I am very pleased with the Tough1 blankets we bought 2 years ago. My two boys have worn them for the last two winters in their turn out together. Only had to replace a couple of leg straps. One of my knuckle heads liked to rub along the fence line, his blanket has some fuzz balls on the outer shell but the other one looks new. Doesn't smell new, just looks good. My horse is out with only 1 other horse but they do pick at each other and this blanket held up with no damage for the season. I have 3 geldings all turned out. So far so good. Is there a neck blanket to go with this blanket? BEST ANSWER: The item does have d-rings along the neck line to attach any kind of neck cover. Tough 1 does make a cover.